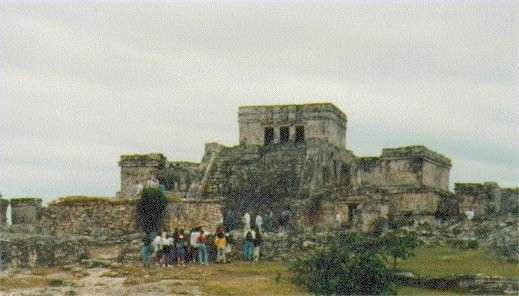 Wide-angle view of the main buildings in Tulum. 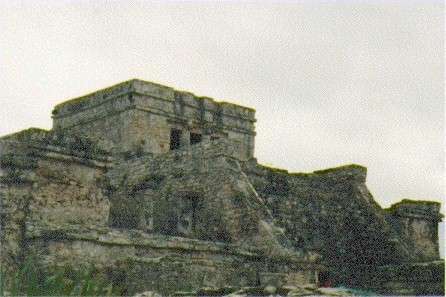 This is the main temple building at the Tulum site. 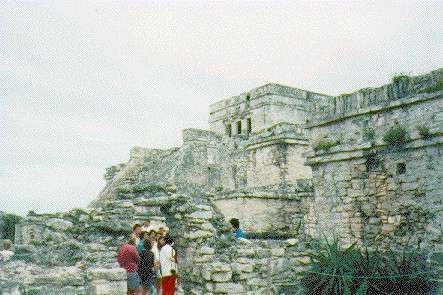 Like most of the buildings here, it is off-limits for climbing. 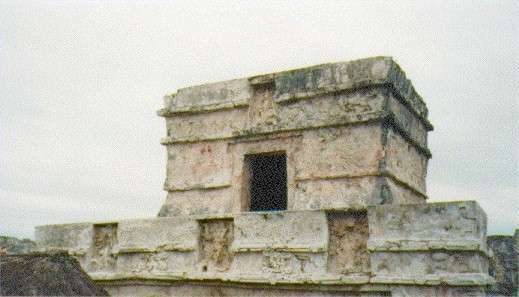 A close-up view of the same building, from the side. 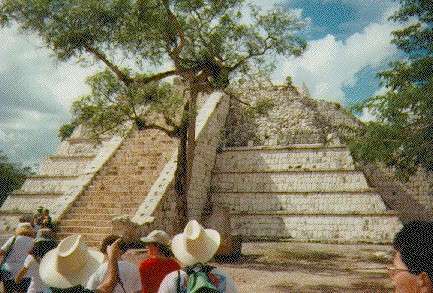 This temple has Tulum's best-preserved carvings. You can see more of the detail in this picture. 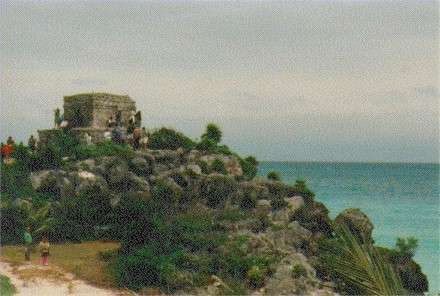 Tulum's sea-side location is unique among Mayan ruins. 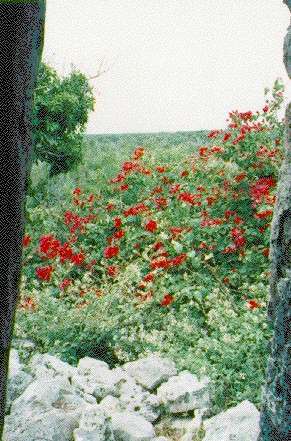 On the opposite side, the jungle stretches on and on. 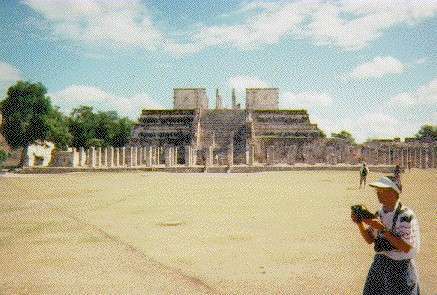 This is the first view you get of the main temple at Chichen Itza. 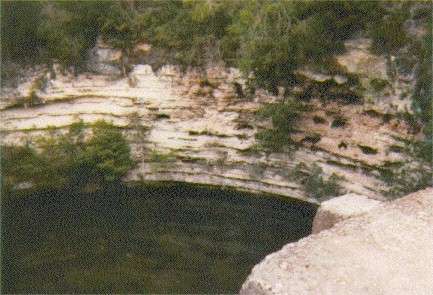 This is the Sacred Well, 150 feet wide. 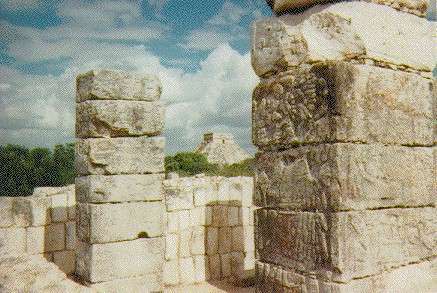 At the top of this temple is a sacrificial platform, or chac mool. 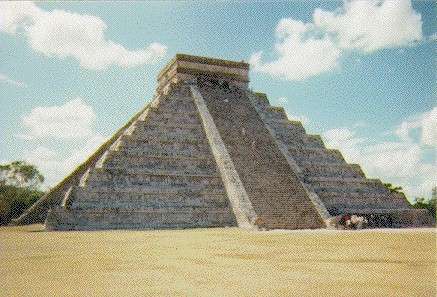 This smaller pyramid is being restored. You can climb it to practice for the big temple. 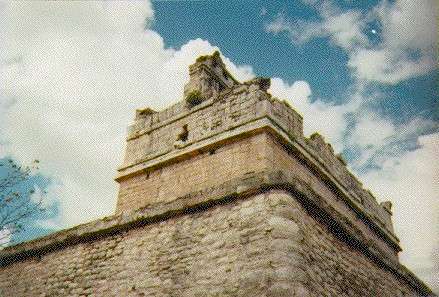 Tower of a central building framed against the sky. Watch out for the killer bees! 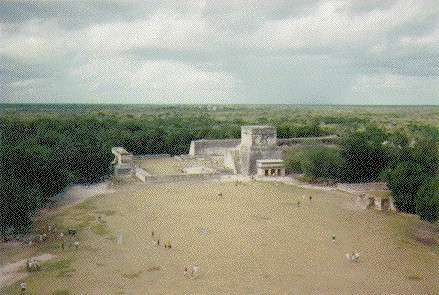 From the Observatory you can only see the top of the main pyramid. 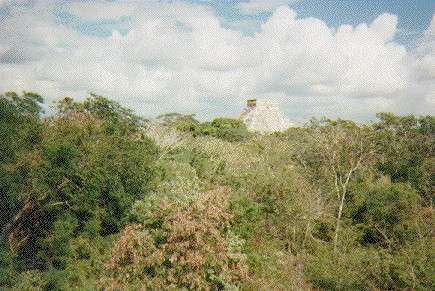 Another long-distance view of the main pyramid. This side of the main pyramid has fewer climbers. 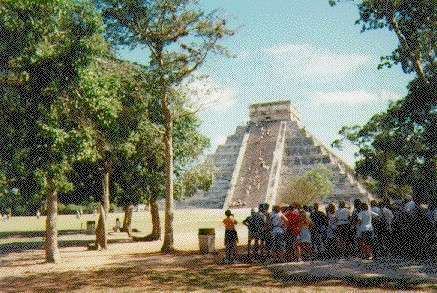 At center right, tourists line up for a peek at the smaller pyramid upon which this one was built. You get some great views from the top of the main pyramid. 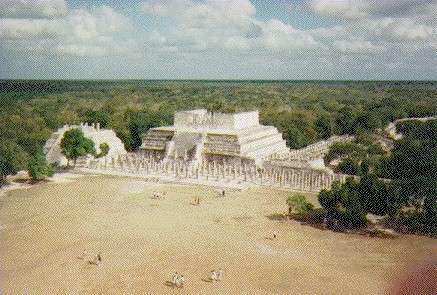 Another aerial view, of the Sacred Ball Court. 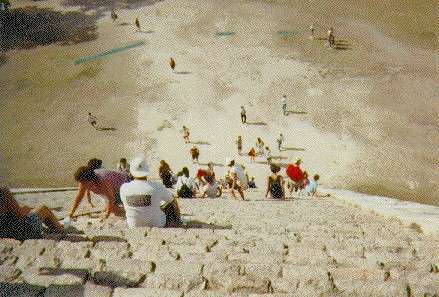 Climbing down the main pyramid. This picture is from about halfway down. 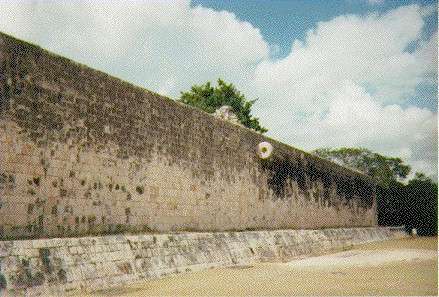 The court of the sacred ball game. The winning team's captain was sacrificed after the game. Historians trace the origins of the New York Jets to this period. 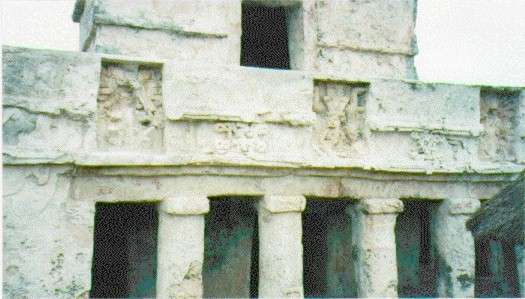 Carvings of ball players, many sporting nose rings and ornate headgear. Historians trace the origins of Dennis Rodman to this period. 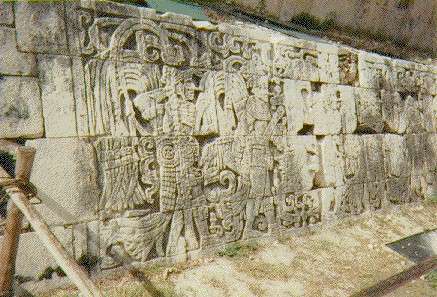 Carvings of skulls. 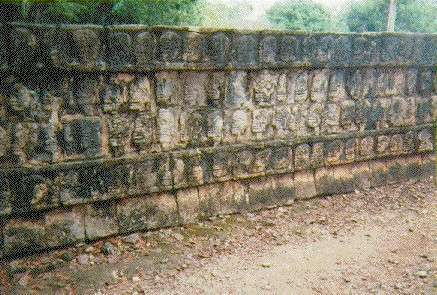 With walls like this, I don't think the Mayans had to worry too much about graffiti.